I think it’s high time to document some of the inner workings of Oliver’s Nest, starting with one of the things that took the longest to fully assemble: the plumbing. Being a simple system, without water heater or electric pump, I thought it would go together quickly, once I decided on all the parts. Not so! It took at least three visits to the local big box store and several reworkings to get it assembled. 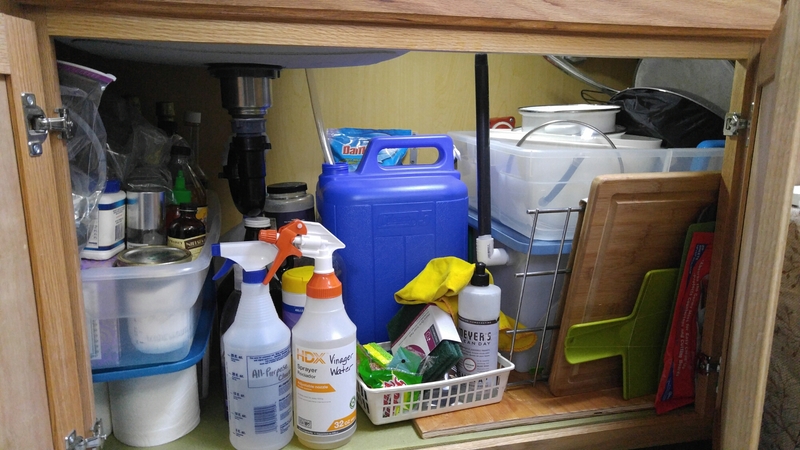 The issue that caused the most problems was not having a normal drop between the sink drain and the waste water holding tank. 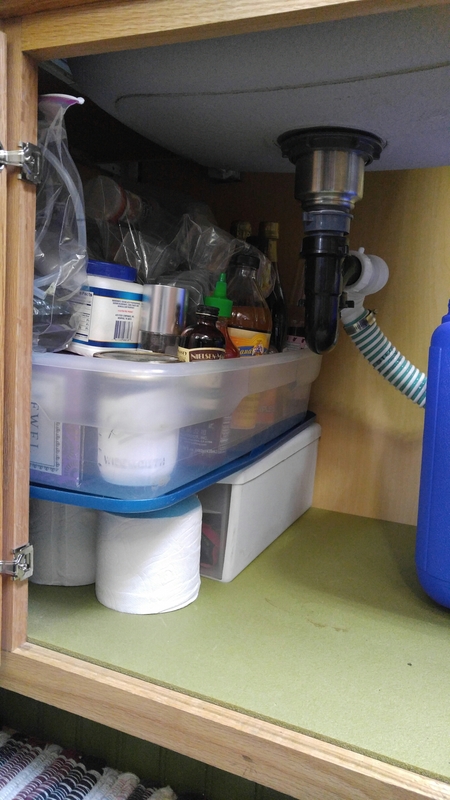 I was determined to have as standard a system as possible, which included the p-trap to capture odors. The inclusion of the p-trap lessened the already shallow drain slope, but not enough to keep water flowing the right way. The big problem was getting the semi-flexible tube to run properly. It was at an angle that caused the end to want to pop off…once it was even coaxed/forced onto the piping to begin with. I’d read that others had the same problems with this tubing. It’s difficult to work with, but once attached is durable so worth the trouble. I finally searched out my extra hose clamps left over from rerouting the fuel lines and used a couple of those to ensure the tubing would stay put even through the rockin and rollin of the house on bumpy roads. Problem solved? Well, yes and no. After using one gallon jugs for a couple months for fresh water, I finally stumbled upon the perfect sized and shaped five gallon jug at Fred Meters. Sturdy and cheap too, so I snapped one up with joy. Until I tried to fit it under the sink and realized with horror(!) that the plumbing I’d sweated over would have to be redone to allow the new addition to sit in the right place. Ugh! So yeah, being me, I put it off for about a week, working up the courage to tackle that damn tubing again. Yesterday I finally confronted it, and wonder of wonders, it went together relatively smoothly. Thankfully, Amazon only sells this tubing in ten foot pieces so there was plenty left to cut the longer piece needed, and is now in its new configuration. Here is the pump I have. This is the water jug I found, and quite a bit cheaper at Home Depot. All tight and tucked away. I am so proud of you. I felt like a sister reading your post. I wanted to clap for you and smile and say “You did it” ! I knew what you were going through because I have attempted some of these things myself too. I have found that sometimes like you we have to take a time out to catch our breathe and then go at it again when we feel our courage is back up again. You are gaining some confidence that you will need in your journey. I imagine the people at the store are happy with your success as well. It is a joint effort and I am so happy that it is coming together for you. Don’t be afraid to speak out to the Doctors who are prescribing medications when something does not work. Keep a journal of your days and nites and show it to them so they can see and understand. You are your best advocate and you are learning to take care of yourself and be empowered. There is no limit to what you can do. Now Enjoy it. Hi Diane, it’s great to hear from you again. ☺ You’re right about the confidence -building time. At least in this case there was no harm in waiting. Sometimes we don’t have the luxury of that, eh? But this was merely a quality of life issue, not a matter of money or supplies wasted. I’m keeping in contact with my doctor on a regular basis while i’m still in the area. Actually, feeling pretty good for a while now! It’s a blessing, don’t you think, given the big change coming up! Again, I’m happy to hear from you as it’s been quite a while since I last posted and I thought perhaps you’d wandered off to a more consistent writer’s blog, hehe. Putting something off for a week is as good as doing it straight away, so don’t knock yourself 🙂 I have a bath to ‘lower’ which I started over a year ago! Ah Eddie, so kind of you to say that, but we both know how much busier your life is! I have none of the excuses you have…just apprehension. Silly me to fret so much over the small things. You want to lower a bath? Is it too high for your little one? Oh wow. That sounds so familiar to some of my issues when building Oliver’s Nest…eventually all was figured out but yeah, it takes time to determine the best course of action!